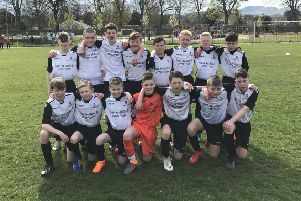 Gala Fairydean Rovers 13s needed extra time to knock out opponents Currie FC in the first round of the Scottish Cup after a seven-goal thriller – the game finally turning following a handball offence in the box. Currie looked very much the stronger team in the opening exchanges and they opened the scoring after just six minutes of play. A mis-hit kick from Rovers keeper Josh Miller was picked up by Murray Fraser, who burst forward into the box and slotted home a composed finish. Currie were enjoying the majority of the possession and almost doubled their advantage only minutes later as the ball came to Connor Thomson, but his shot dribbled left of the goal. The first real chance for Rovers didn’t come until halfway through the first half when Archie Hendry dribbled past his marker and got through on goal. His shot slipped through the keeper’s legs but was booted off the line by a defender. Five minutes before half-time, Thomson made amends for his earlier wasted chance, blasting a shot from the edge of the box which arrowed into the top left corner of the goal. At half-time, Currie deservedly led 2-0. They were able to capitalise on possession and commit players forward as Rovers struggled to create opportunities in the final third of the pitch. Rovers very nearly found a way back into the match only minutes after restarting, as efforts from Russell Kerr and Sam McAneny drifted inches wide of the post. Rovers scored their first goal of the game in the 37th minute. Close ball control and good feet meant Lewis McEwan was able to find a yard of space and he curled a shot from the left side of the box, smacking off the upright and into the goal. Only five minutes later, McEwan scored again to tie the game at 2-2. Parents on both sides of the touchline looked stunned as he showed great skill and finesse to curl the ball into the net from a corner on the right side of the pitch. Rovers almost took the lead through James McLeod, who was strong in attack and held up the ball well before turning to shoot, but his shot clipped off the crossbar and went behind the goal. In the closing stages of the match, Currie were awarded a penalty. Scot McLachlan took the responsibility of taking it but his effort bobbled wide. At full-time, the score was 2-2 and extra time beckoned. Rovers were the first to score in extra time. Russell Kerr was able to control a long ball forward and shot across the keeper tucking the ball into the back of the net. Currie picked themselves up and responded well, winning a free kick in front of the box. Toby Robson fired an effort at goal, his shot taking a wicked deflection off a Rovers defender with the keeper left stranded as the ball flew past him into the back of the net. Chances in the second half of extra time were scarce as players grew tired and penalties looked imminent. However, three minutes before time Rovers were awarded a penalty after a handball in the box. Harry Fowler made no mistake as he shot straight down the middle. Currie FC 13s: Jamie Cook, Murray Fraser, Mark Henderson, Archie Irwin, Alex Marsland, Jamie McCarlie, Jonny McDonald, Nathan McIntyre, Scot McLachlan, Barnaby Mitchell, Toby Robson, Christopher Scott, Matthew Smans, Connor Thomson, Alasdair Wallace. Gala Fairydean Rovers 13s: Josh Miller, Jack Stenhouse, Greig Moffat, Finlay McKechnie, Sam McAneny, Robbie Paterson, Niall Louth, Callum Marshall, Ritchie Mitchell, Lewis McEwan, Harry Fowler, James McLeod, Ben Naylor, Kai McCrae, Archie Hendry, Russell Kerr.